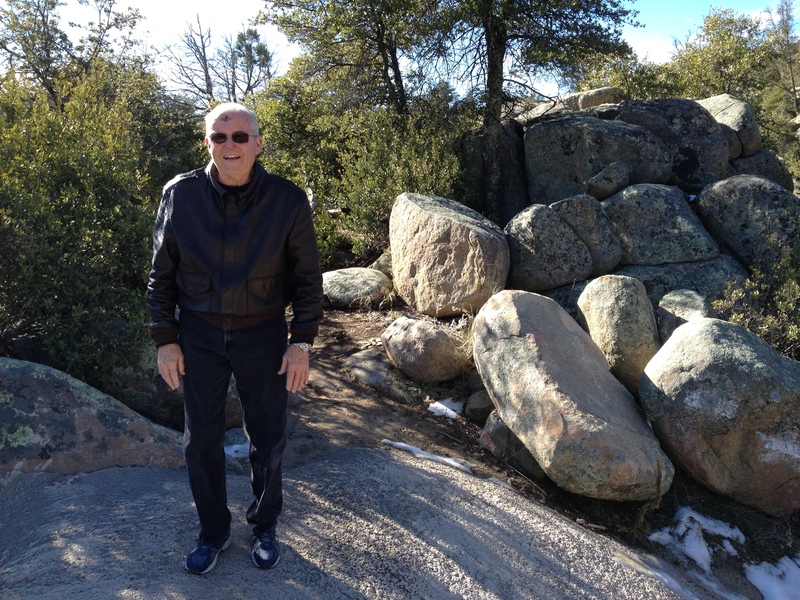 Winter is a special time for hiking in Prescott. Cooler temperatures allow longer, less sheltered hikes. Sunny days with temperatures in the upper forties to upper fifties are best, but I’ve hiked when temps were in the thirties. You soon warm up as you hike along. Snow creates its own challenges. Recently we hiked the Centennial trail. It is named for the Arizona Centennial and was opened in 2012. We hiked it in September of that year. It was beautiful with flowers still in bloom. This time we hiked it after a snow. The beginning of the trail was muddy, but there were plenty of boulders on both sides of the trail. In most cases we were able to step on the boulders and avoid the mud. 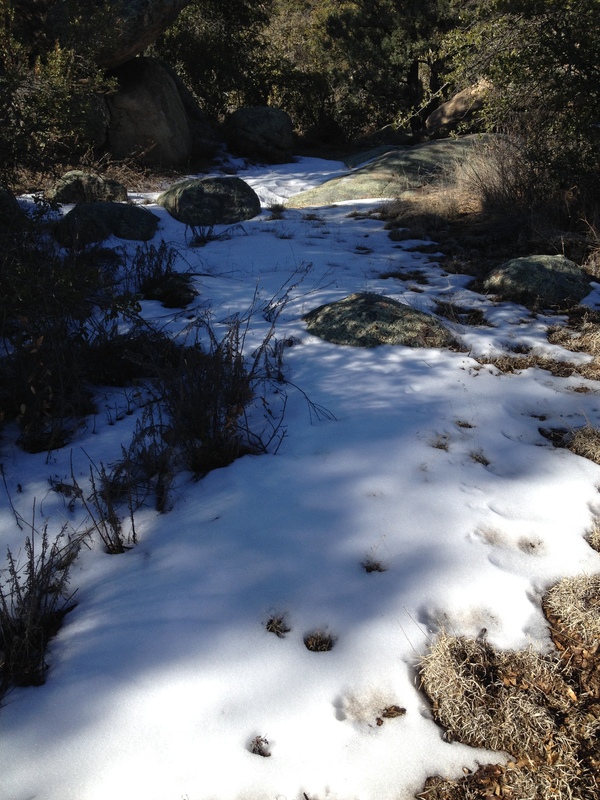 As we came around to the north side, the trail was still covered with snow. Making our way up the north face, we tramped through snow most of the way. The snow had melted in some places, leaving very gooey mud. In other places it had refrozen into slippery ice flows. At various spots along the trail we had to cross small streams. Again, strategically-placed boulders provided a way across. After our climb, we descended into a secluded valley–very mystical and delightful. After climbing out of the valley–on snow-packed trails of course– we were treated to petroglyphs and magnificent homes in Enchanted Canyon. You can reach this trail off of Gail Gardner Way. Turn onto Westridge and go about a half mile. There is a small parking lot on the right. Then walk along Westridge for about 100 yards to the trailhead. To avoid the snow and mud, we have elected to hike the trails along Pioneer Parkway and Williamson Valley Road. 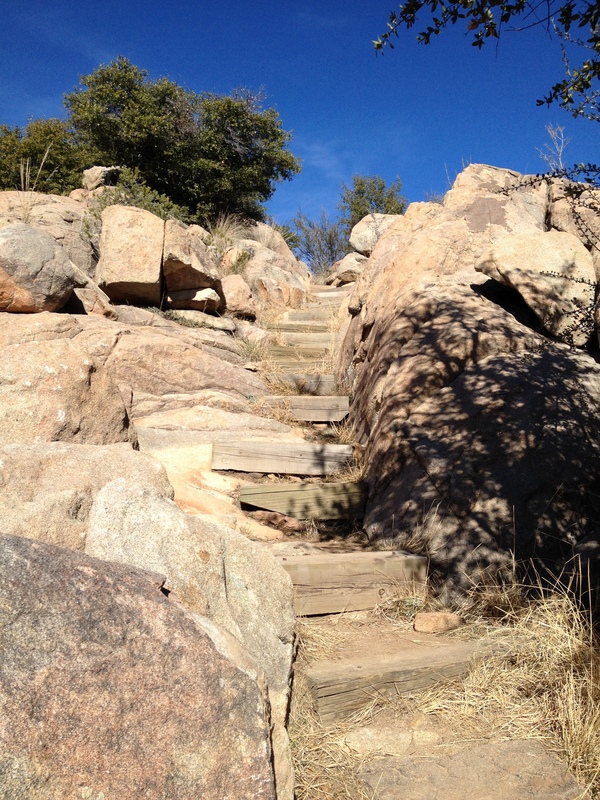 Many of the trails in that area are part of the Circle Trail that goes all the way around Prescott. You can begin the Legacy trail at Kuebler Field just off of Commerce Drive. Vegetation is sparse in places which makes it great for winter hiking. The trail goes under Pioneer Parkway three times by way of nicely lighted underpasses. There are great views of the Granite Dells, Granit Mountain and Glassford Hill. You can also begin this trail off of Williamson Valley Road. There is a small parking area on the east side of the road just after the intersection with Pioneer Parkway. The trails around Watson and Willow Lakes are also good choices for winter hikes. Most of the time you will be walking on boulders, and snow melts away quickly there. We usually try to avoid the trails off Walker Road or Senator Highway after a snow, but otherwise they are also good for winter hiking on warmer days. The important thing is to get out there and hike. Spring is just around the corner and you’ll be ready as the snows melt up north and the flowers begin to bloom.